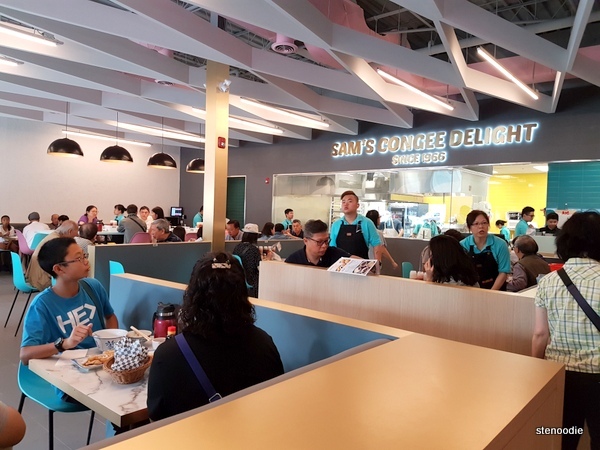 Brand New Location of Sam’s Congee Delight! 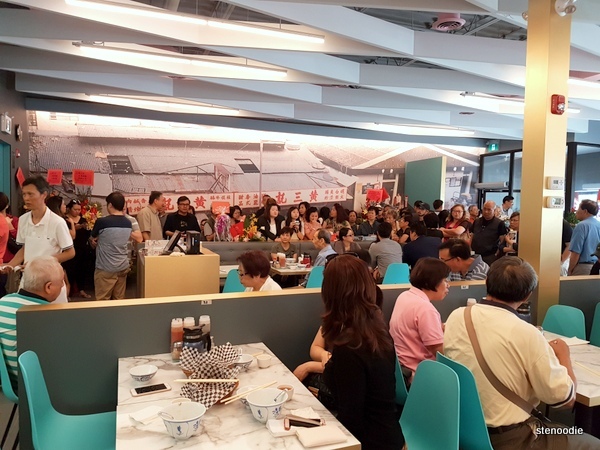 August 3, 2018: Today was a very anticipated day for many long-time Sam’s Congee Delight fans! 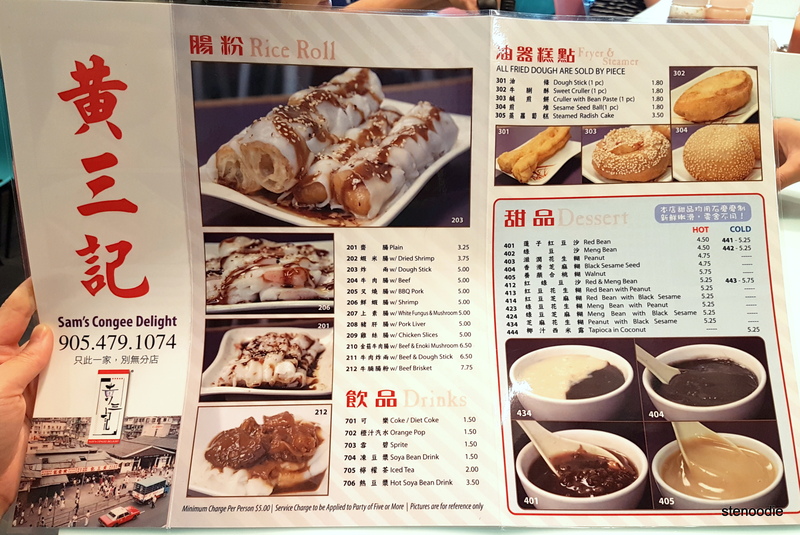 Sam’s Congee Delight (黃三記) is the infamous congee and silky smooth rice rolls restaurant that used to reside inside Market Village for over two decades. 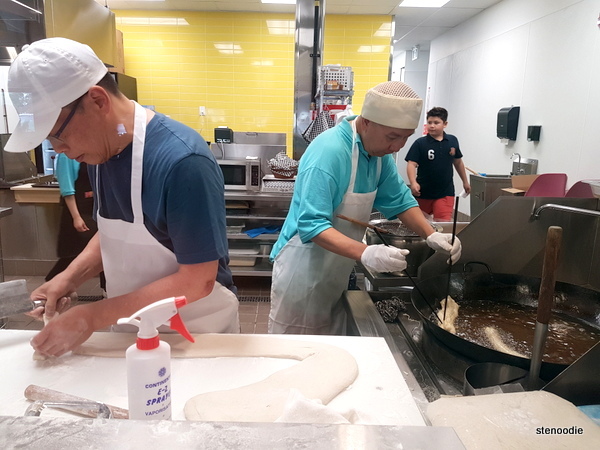 Upon the closure of the shopping mall however, Sam’s Congee has now newly relocated itself to the northwest corner of Woodbine and Denison in Markham (7354 Woodbine Ave which is directly across from the Starbucks and Eggsmart Plaza). 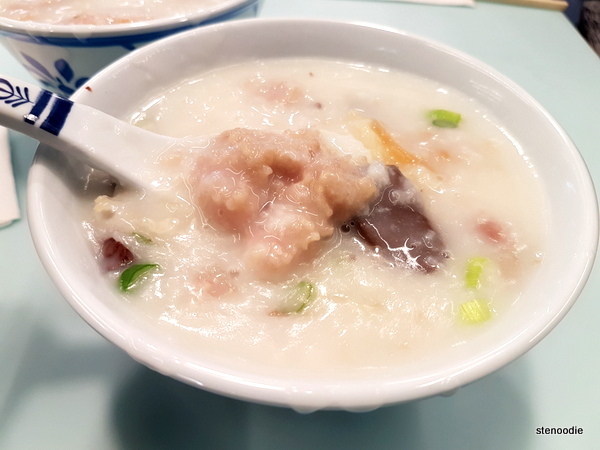 I noticed that a fellow foodie shared the news of Sam’s Congee Delight opening their doors to the public on August 3, 2018. It just so happened that I didn’t have work that day and could dine there on their grand opening day. I was really excited to be one of the first to see their new space (and see if they had maintained an open kitchen area with a window for customers to watch the cooking process — it was definitely a highlight and feature of the old restaurant). Congratulations on their new location! We arrived at the brand new location just after 11 a.m. and was lucky enough to find a parking spot just as some other customers were leaving. The parking lot for this plaza is not very big so you’ll have to keep your fingers crossed to find a spot during peak hours. We arrived just in time to see the owners and family friends take a photo in front of their store with a giant roasted pig in celebration of the grand opening day. There were a lot of flowers commemorating their grand opening too. 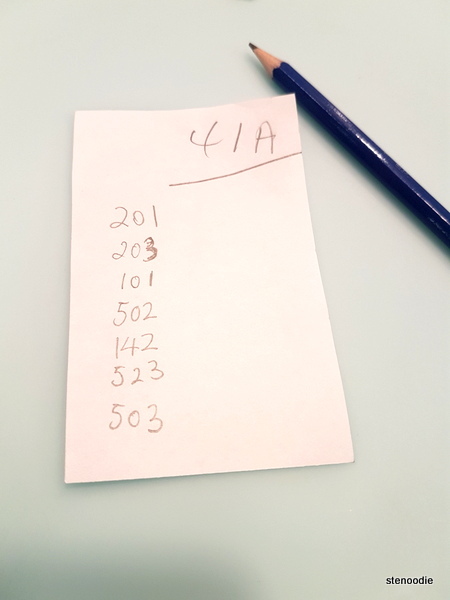 We got a number from the front desk as we waited for our turn for a table. There was a line-up already but the space was so large that I was sure the wait wouldn’t be long for us to get a table. 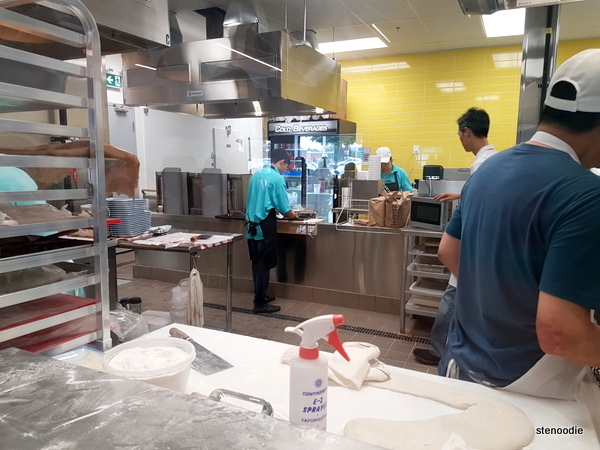 In the meantime, we went up to the windows (yay, they kept these installed) so that we could see the cooks prepare the rice rolls and dough fitters just like it used to be at the old location! 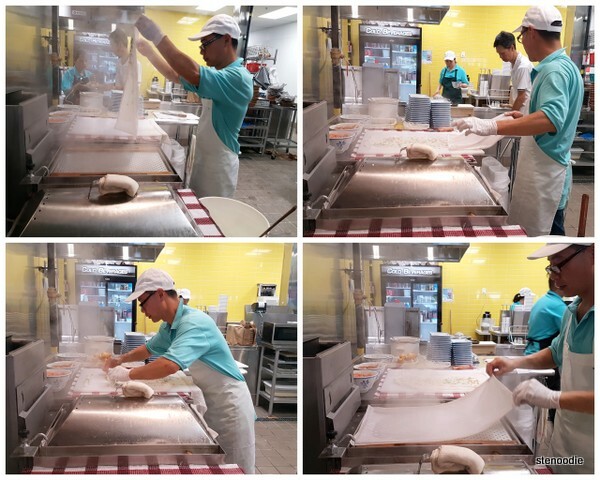 The window was much bigger here and you could clearly see everything being made in front of you. 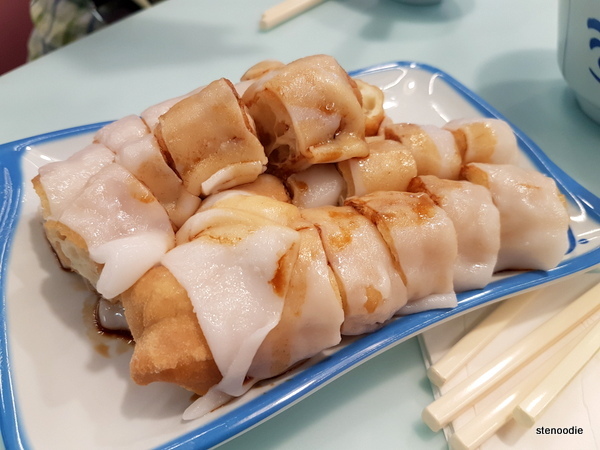 It was a decades-honed process and despite the new location, the cheung fun/rice roll/dough fritter masters churned out perfect rice rolls and dough fitters just like they used to do at the old location. Fried dough fritters and crullers! After 15 minutes of waiting, we got a table! We were given one of the communal long tables to sit which was fine. The high table was actually quite comfortable to sit at. 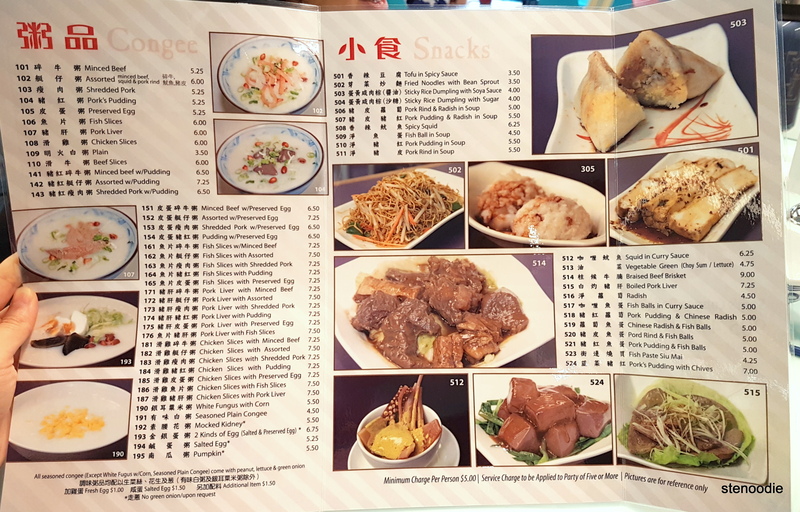 The menu was essentially the same and the self-order system was still in place (you write down the numbers of what items you want to order and give it to a nearby server). It’s a fast and efficient ordering process. Our table full of deliciousness! 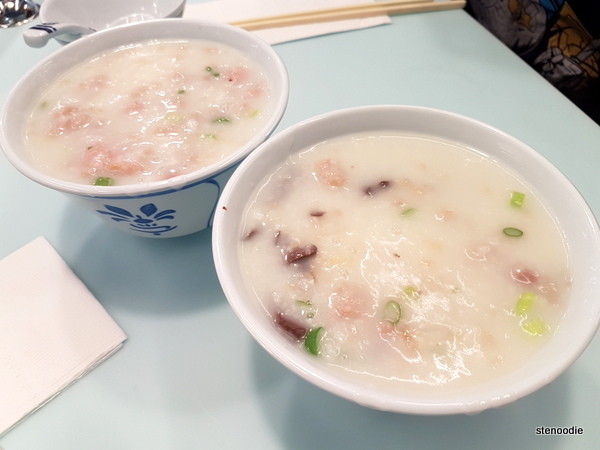 Their Minced Beef Congee is just as good as before. I noticed that the size of the congee bowls is slightly smaller than before though. The Assorted Congee with Pudding (pig blood jello) had also minced beef in it which was great. 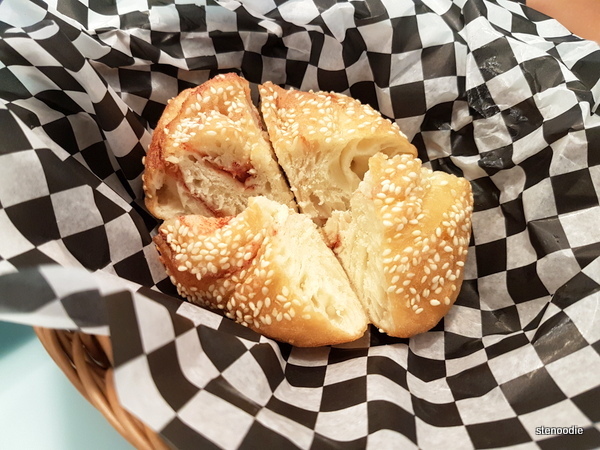 The Rice Roll with Dough Stick was also really good too. 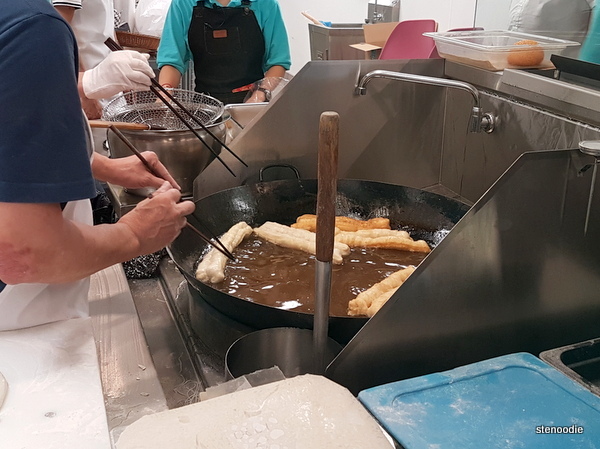 The super thin rice roll sheet goes so well with the fried dough fritter. The Sticky Rice Dumpling with Soya Sauce was great too. 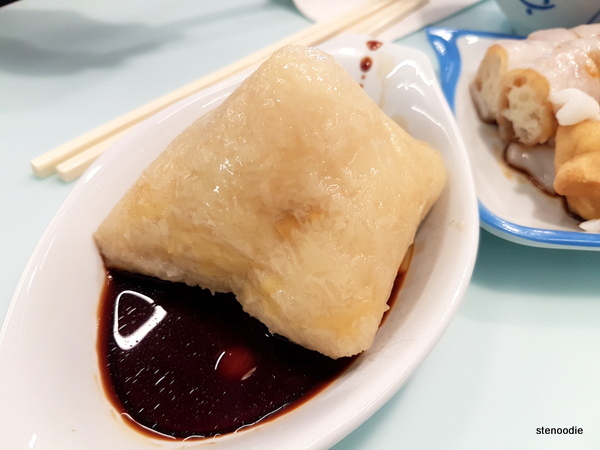 😀 It’s a classic rice dumpling. 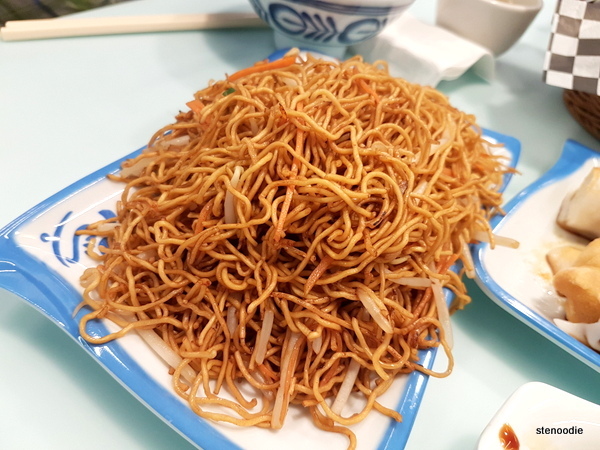 The Fried Noodles with Bean Sprout is another classic to order with congee. 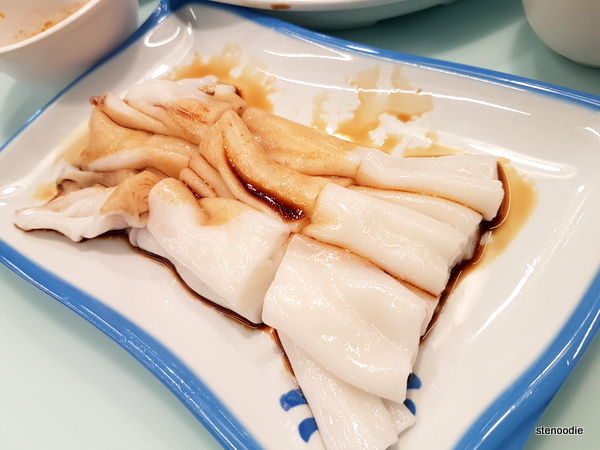 The Fish Paste Siu Mai was so-so. 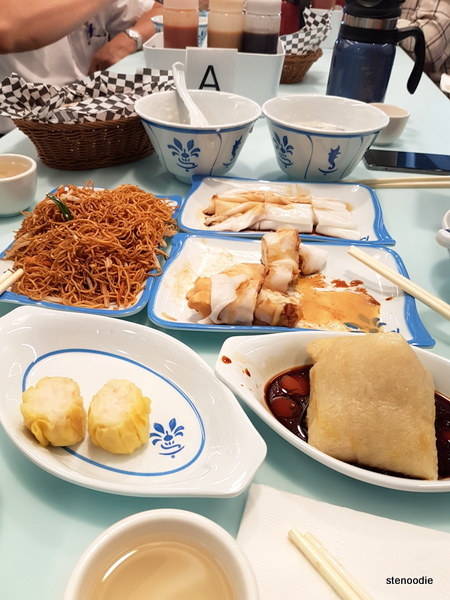 There are better tasting and bigger fish paste siu mai at the food court at First Markham Place. 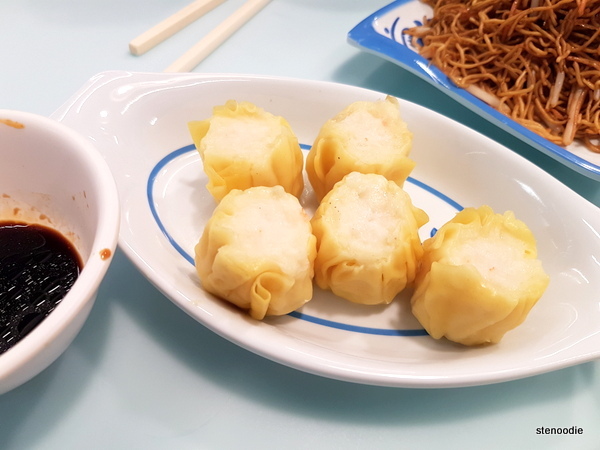 I did like the slightly spicy soy sauce that came with these siu mai though. The Cruller with Bean Paste was pretty good but I wish there was more bean paste in it. This was the view as we finished our meal. Look at all those people waiting for a table! 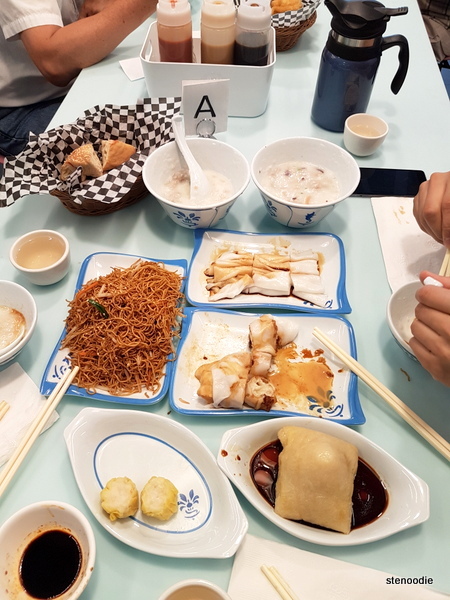 This entry was posted in Food and tagged 7354 Woodbine Ave, Assorted Congee with Pudding, best congee in Toronto, Chinese, Chinese comfort food in Markham, Cruller with Bean Paste, Fish Paste Siu Mai, food blog, foodie, Fried Noodles with Bean Sprout, Markham, Markham Congee, Minced Beef Congee, new location of Sam Congee, Plain Rice Rolls, restaurant review, Rice Roll with Dough Stick, Sam's Congee Delight, Sam's Congee Delight (黃三記), Sam's Congee Delight food reviews, Sam's Congee Delight menu and prices, Sam's Congee Delight new location, Sam's Congee Delight open kitchen, silly smooth cheung fun Markham, smoothest rice rolls in Toronto, Sticky Rice Dumpling with Soya Sauce, Woodbine and Denison. Bookmark the permalink. 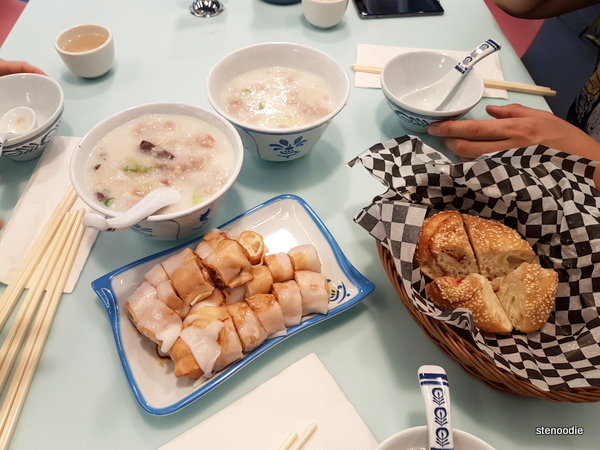 3 Responses to Brand New Location of Sam’s Congee Delight! All your foodie posts are making me hungry at night! Ahhhhhhhh! This location looks a lot nicer than the Market Village one! Hahaha in other words, it’s helping you digest your stomach fully of whatever else you had left in there! 😂 Yea this one is huge compared to the old location! You should come here to try and see what you think of the new place, Grace!